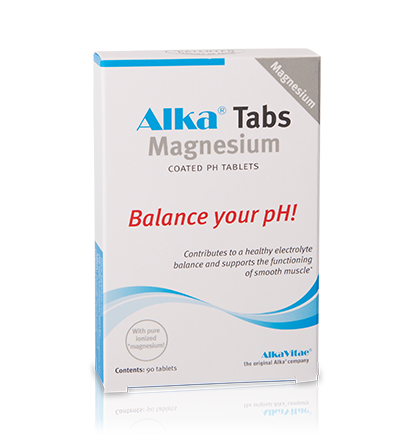 Alka® Tabs Magnesium tablets help you deacidify your body while giving it extra magnesium at the same time. Perfect for those who need to counteract acidity in the body and require extra magnesium. How do Alka® Tabs Magnesium deacidify the body? 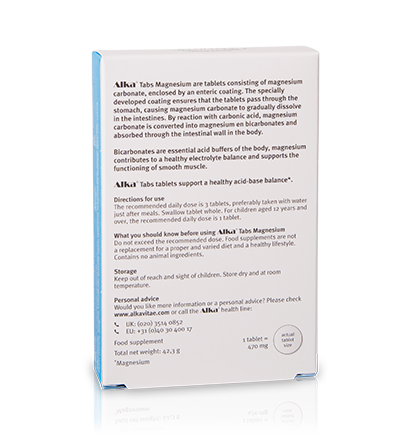 Alka® Tabs Magnesium combine deacidification with the addition of magnesium. Everyone is aware of how magnesium benefits the body. But did you know that the compound magnesium carbonate has the highest level of magnesium? The downside to magnesium carbonate is that its absorption is inhibited by gastric juices. The bicarbonate ions are absorbed through the intestinal wall and neutralize the acid waste present in the body. In other words, they deacidify your body! The magnesium ions are absorbed through the intestinal wall and enhance the free flow of magnesium in the body. A highly efficient process! 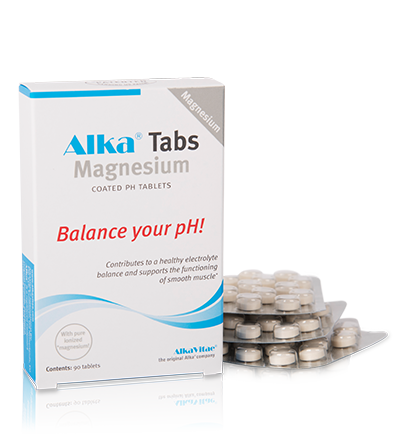 Alka® Tabs Magnesium tablets have a ‘time release’ function, which means that they dissolve gradually in the intestines. Gradual absorption through the intestines is highly efficient way for the body to absorb nutrients. Adults: 3 tablets daily. Preferably taken with water just after meal. Swallow tablet whole. For children aged 12 years and over, the recommended dose is 1 tablet daily. Do not exceed the stated dose. Food supplements are not a replacement for a proper and varied diet and a healthy life style. Contains no animal ingredients. Keep out of reach and sight of children. Do not expose to direct sunlight. Store dry and at room temperature. Ingredients: bulking agent (cellulose), stabiliser (xanthan gum, silicon dioxide), maltodextrin, acrylate copolymer, glazing agent (glycerol, magnesium stearate, talc), anti-caking agent (stearic acid), mineral.